ACTS 2:21 KJV "And it shall come to passe, that whosoeuer shall call on the Name of the Lord, shalbe saued." And whoever makes his prayer to the Lord will have salvation. 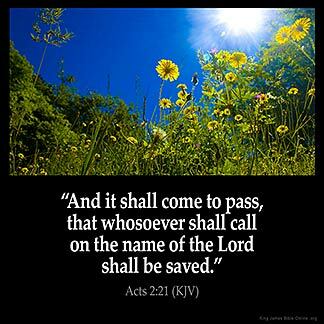 And it shall come to pass, that whoever shall call on the name of the Lord, shall be saved. And it schal be, ech man which euere schal clepe to help the name of the Lord, schal be saaf. 2:21 But - whosoever shall call on the name of the Lord - This expression implies the whole of religion, and particularly prayer uttered in faith; shall be saved - From all those plagues; from sin and hell. Ac 2:21 Whosoever shall call on the name of the Lord, etc. To turn to the Lord for salvation in his appointed way. It means far more than simply prayer. He who would call on the name of the Lord for salvation must do more than say, "Lord, Lord, open unto us" (Lu 13:25). He must hear and obey (Mt 7:21).